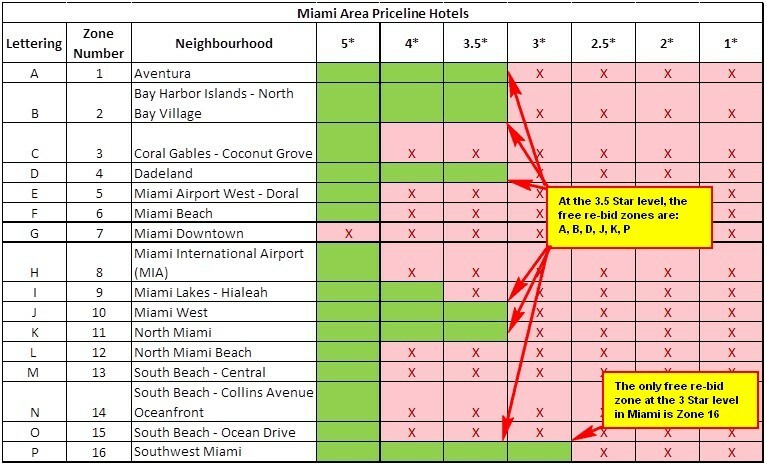 From the above 3 steps, we have established that the hotels we are likely to get are acceptable, what our maximum bid should be, and what the re-bid zones are. Based on this, we can set up a strategy. When setting up a strategy, I like to look at where I am likely to get accepted, based on the lowest price from Priceline’s Express deals. 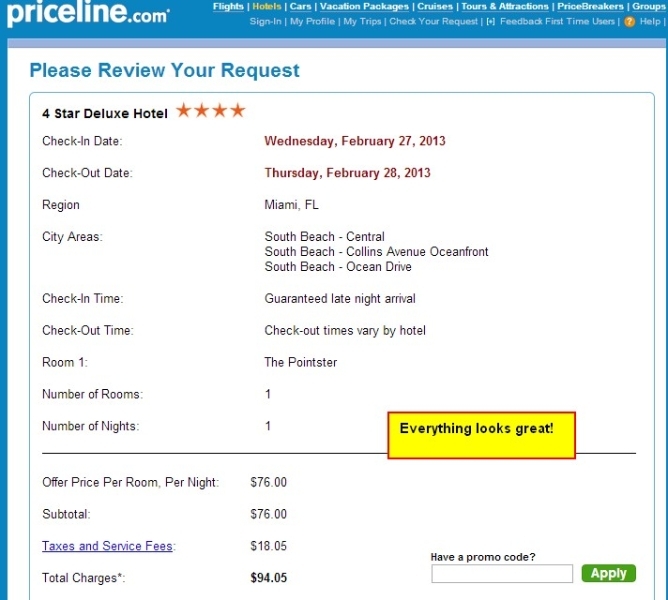 In this case, it looks like Priceline Express View is favoring Central zone, so we will use that as the “base” zone. 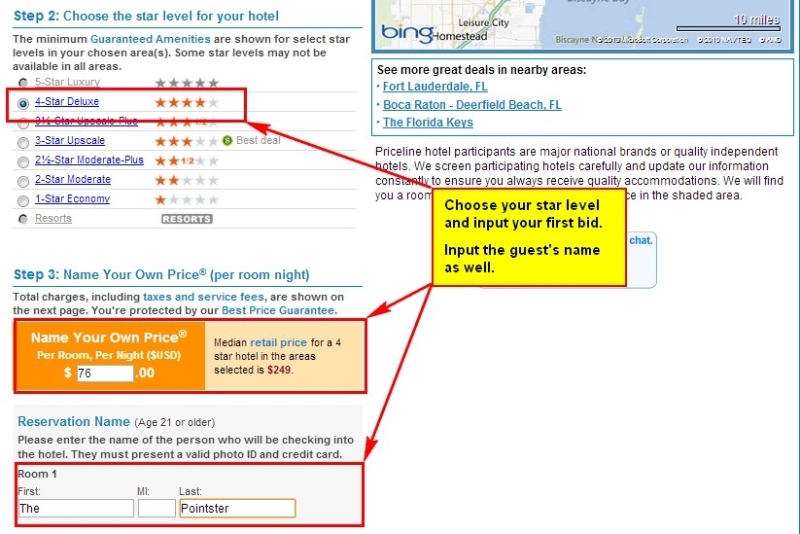 Since this zone contains what I suspect is the chepaest acceptable hotel for a 4 Star bid, I want to make sure that this zone is in every bid that I make. Based on how many bids I want to bid with (combined with the limitation of how many free re-bids I get), I can establish a strategy. In this case, I understand that each bid takes about 5 minutes of my time, and I have lots of free re-bids (at least 64 for the 4 Star). I have established the maximum price I would be willing to bid on each Star Level ($118 for 4 Star), and I knock down about 35% to set my starting bid ($76). I then increase that by a few dollars ($4 each bid) and outline which zones will be bid and at what rate. In this case, I have already established that I want to only target the 4 Star hotel and thus I will not go after the 3 Star hotels. For the purposes of this exercise, my acceptable area includes 3 zones. I do know what zone contains the cheapest hotel and will use that as my base zone. If I needed more free re-bids, I could treat the other 2 zones as free re-bid zones. Since I have lots of free re-bids at the 4 Star level, I will just bid zones M, N & O as my “base” zone. Note: If I were bidding on a 3 Star, I would want the extra bids. Pointster’s pointers: Adding a zone to a bid saves time, so if I am not using all my free re-bids, I would rather add a zone (add B to a rejected OA bid) to save a few minutes rather than restarting the process. In this situation, if the bid of $112 gets rejected, I would just go and buy my hotel for $118 that was available for a regular purchase. I will walk you through the process of actually bidding through the following screenshots. 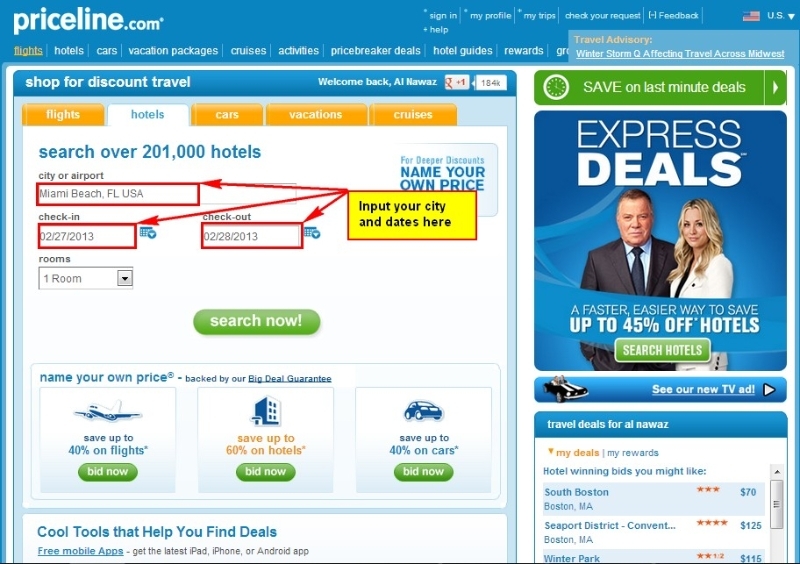 As I have mentioned before, you can get a small amount of cashback (around 1% – 3%) by using portals to book your Priceline. I like eBates and Top Cash Back for Priceline bookings. 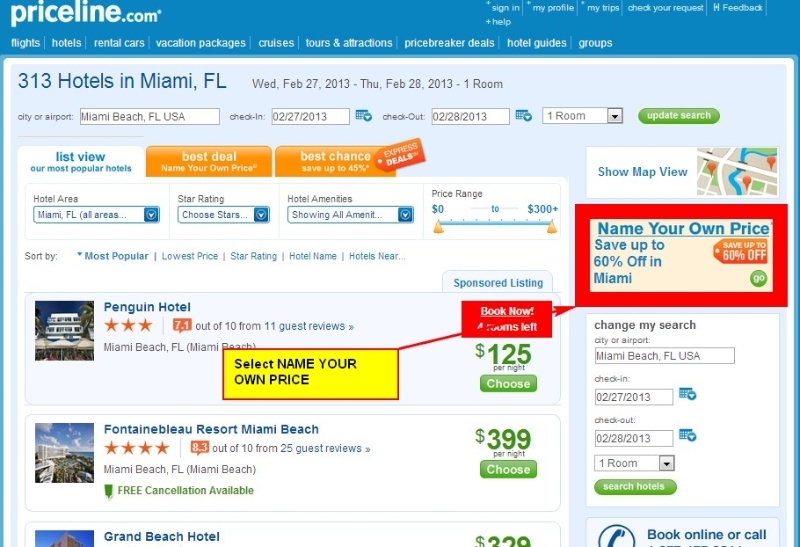 In this situation, Priceline was not able to deliver a hotel for less than the $118 that Hotwire was offering. 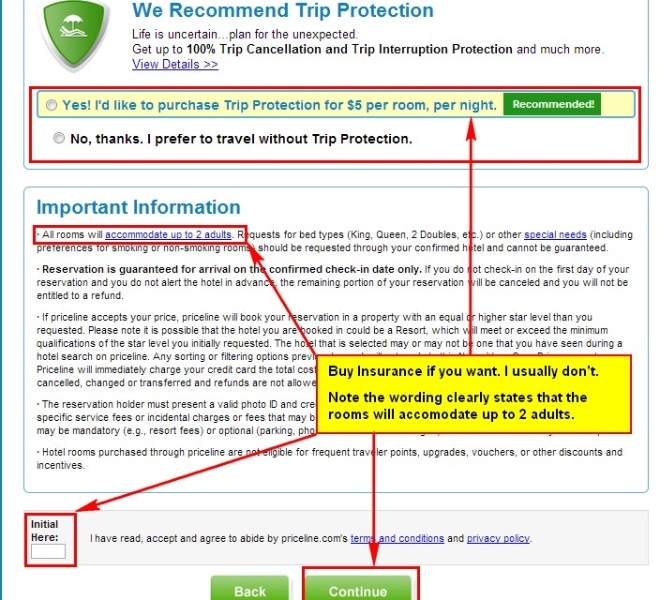 As a result, the decision should be to take the 4 Star hotel for $118 from Hotwire. Once you have established the free re-bid zones, maximum prices and the acceptable zones, you will want to set up a strategy. 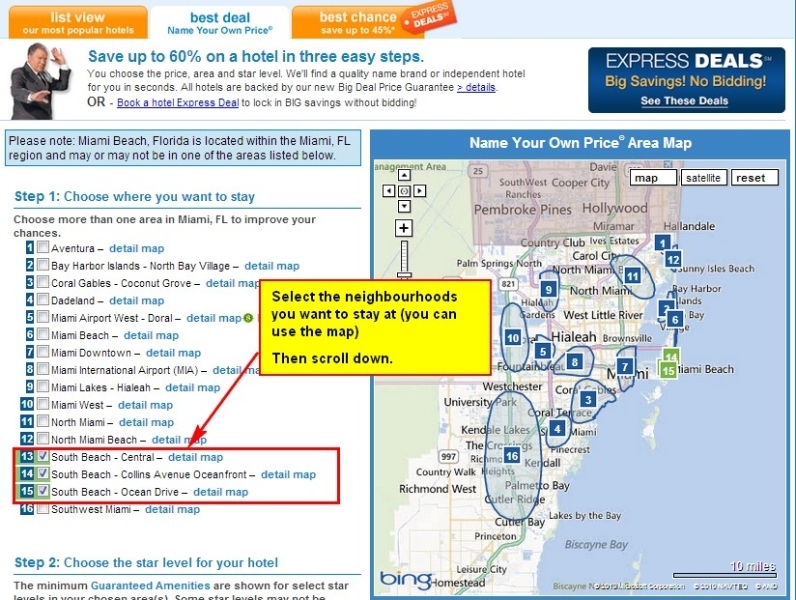 If there your acceptable area contains multiple zones / neighbourhoods, pick the one that has the cheapest hotels as your “base” zone so it is always included. If you have a lot of free re-bid zones, then just include all of the acceptable zones as a base zone. Set up your strategy including a schedule of your prices, zones and star level in advance of starting to bid. If you have limited free re-bid zones then you will want to restart the process after each attempt. If you have many free re-bid zones then you can just add zones when a bid gets rejected. Finally, have fun with this. The first time I bid on Priceline, I got a crazy rush for those 30 seconds, when I wasn’t sure if my bid would be accepted. Don't subscribe All Replies to my comments Notify me of followup comments via e-mail. 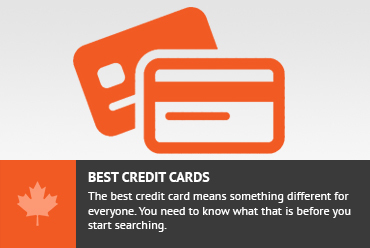 You can also <a href='https://www.creditwalk.ca/comment-subscriptions/?srp=757&srk=2648578ecea05c83754707575dc5a494&sra=s&srsrc=f'>subscribe</a> without commenting.